Posted on July 23, 2018 by Fay Curtis. 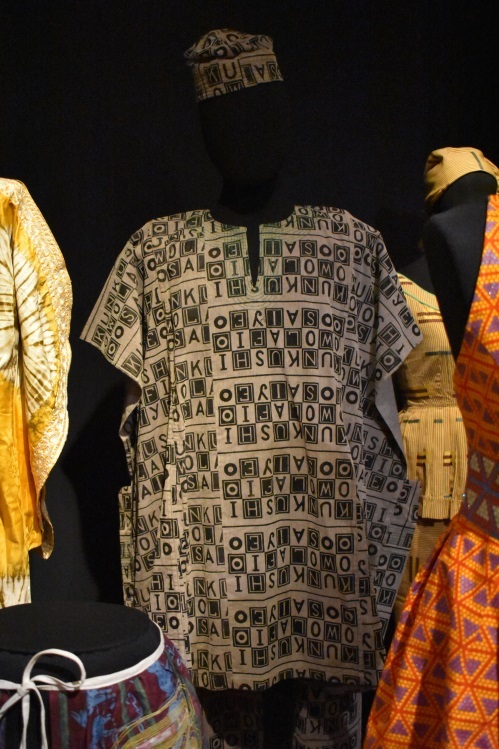 The Fabric Africa: Stories told through textiles exhibition is now up and open for all to visit. I hope you enjoy the selection of items I’ve put together. As the exhibition title suggests, there are many different ways of engaging with them, and many stories that one item can tell. This has the face of Queen Elizabeth II on it! Not being a great fan of the monarchy myself I’m always intrigued to find out why other people are. In African countries colonised by Britain in the 19th century, loyalty to the British monarchy was instilled into its new ‘subjects’ through systems of government, schools and the Church. Today the Queen remains as Head of the Commonwealth, symbolic leader of many African ex-colonies. I wondered if the person who made this item felt like they were still Her Majesty’s subject or whether they just liked the material her image happened to be on. This costume’s ambiguous gender interested me – is it male or female or both at the same time? I knew that this masquerade costume, used by the Igbo people, was worn by young men representing the spirits of young women that had died. The full costume would cover their faces with a wooden mask and their performance was designed to make the audience believe these men were indeed female. Without understanding the Igbo view on gender fluidity I thought it was intriguing to speculate that this costume could represent a different way of looking at the binary male/female division. This dress is made entirely from the beaten bark of a tree! Amazing. ‘We can enjoy the world if we have a great amount of money’. Because it’s so cute and who doesn’t love a bit of lurex?! Cheating a bit here as there are several items included in this one – the ‘wax print’ cotton fabrics with their beautiful imagery. They show abstract designs that dazzle, they use colours that are vibrant and bold and their symbols are a fascinating glimpse into the cultures they are worn in. For example, there’s one textile that shows ceremonial swords of royal families; another, a chameleon that represents transformation; cobs of corn as the staple food of the region and an intertwined knot symbolising reconciliation. See if you can spot them in the exhibition. We’d love to hear your stories about African textiles. Have you ever worn anything similar on a special occasion? Do you know what the symbols represent, or remember seeing and being inspired by textiles like these somewhere else? 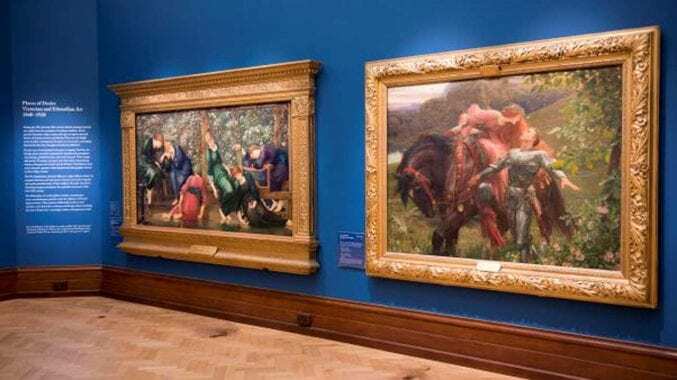 If you have any thoughts please leave them in the comments below, or you can send them through to us on the screens in the gallery. We’d like to collate your stories to share on our websites and social media. 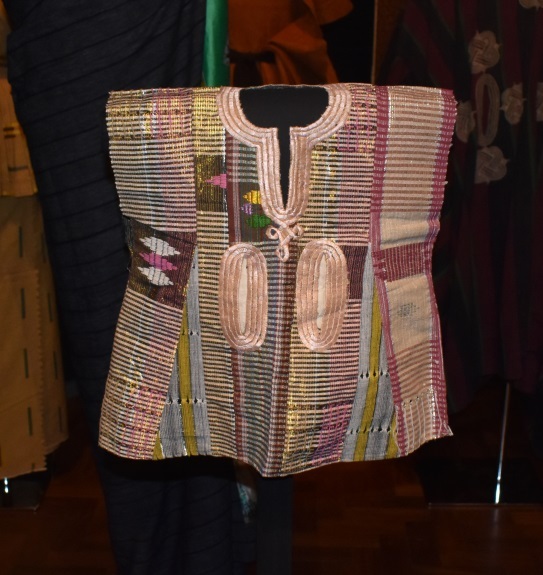 Fabric Africa: Stories told through textiles is now on at Bristol Museum & Art Gallery until 19 May 2019.